If you read my post about how I killed the sweetest dog I’ve ever rescued after giving her the NSAID Previcox for arthritis here, http://savingcatsdogsandcash.com/previcox-killed-my-dog/, you may remember that the very first sign that Sadie was suffering from the side effects was her refusal to eat one night. Knowing my dog better than anybody, I called the vet and ended up talking to the vet tech, who I know was pretty experienced. Even if she wasn’t, she should have at least known that a dog suddenly not eating wasn’t a good sign. Instead, she (and the vet) brushed me and my concerns off. Repeatedly. From that very first symptom of not eating, Sadie continued to deteriorate until she died a few days later. With my second experience with a dog not eating, it was a completely different situation. Roxie was also having obvious signs of trouble going potty, so it made sense that she didn’t feel well and her appetite was affected. The vet that examined her ran a blood and urine test and concluded Roxie just had a UTI. We were sent home with antibiotics. If the issue had just been a simple UTI and the antibiotics had worked like expected, I wouldn’t be writing this post. Unfortunately, the antibiotics helped but didn’t completely resolve the UTI. Not wanting to put Roxie back on more antibiotics, and because I thought I had a correct diagnosis from the vet, I decided, after extensive research, to try to cure her UTI with natural remedies. Roxie’s appetite never fully returned and near the very end, it gave out altogether. Looking back, the signs were there that something wasn’t right, but when you’re in the middle of caring for a sick pet and have information that you believe is correct, you make decisions that you think and hope are right. At the time, I erroneously thought that as long as Roxie was eating something, it was a good sign. It wasn’t. Luckily, with every dog you have, and every experience you go through, you learn something and hopefully become a better owner for it. Unfortunately, when you look back, you always wish you knew then what you know now so the outcome could have been different. With Roxie, she had sailed into her senior years without any health problems at all. Her excellent health her entire life had not prepared me for her to ever have any major health issues. When she did, I underestimated how severe they might actually be. When it comes to their appetites nowadays, especially my two seniors, I’m very attentive. Even though I monitor everything that goes in and comes out of all of my animals for anything unusual, I now have a bit of apprehension about who, when, and what the next health crisis will be. One thing is for sure, if one of my current crew suddenly stops eating and doesn’t resume back to normal within a few days, or symptoms continue after a vet visit and treatment, I’m assuming the worst and heading back to the vet for more testing. Seeing firsthand how quickly a dog that stops eating can deteriorate, I definitely know to be more vigilant in the future. 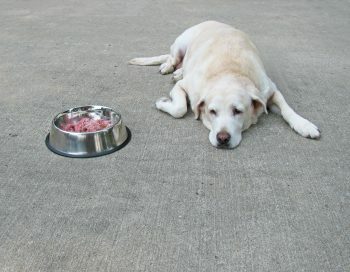 Like finding blood coming from your pet or eye issues, like I wrote about here, http://savingcatsdogsandcash.com/be-careful-with-any-dog-eye-issues/, not eating is another big cause for concern that warrants a trip to the vet sooner rather than later. You know your pet better than anyone, so make sure you trust your gut. If your vet is not concerned or if your dog is still not eating normally after treatment, find another vet or insist your dog be seen again. Roxie ended up dying a slow and painful death from cancer because I’d spent too long chasing a cure for a UTI, instead of the bigger diagnosis, which turned out to be cancer.